Scuppers are drain openings, placed through walls, that drain heavy water flow and debris away from commercial flat roofs. Watch the video below. We are cutting away the edge of an EPDM rubber roof to lower it to install a scupper that will drain into a gutter. It is important to make the scupper wide enough to handle the amount of water drainage typical for each climate. A scupper that is too narrow will become easily clogged with leaf debris, causing the pooling of water. Proper positioning and size of a scupper is essential for water and debris drainage. The video below shows how we lowered and increased the size of an existing scupper, in a parapet wall. It was positioned too high, and it was too narrow which made it difficult to clean. We found that trapped tennis balls were restricting proper drainage. Find points on a roof where water will drain naturally. Make sure that runoff from the scupper does not accumulate around a foundation or wall. Make scuppers wide enough to handle large amounts of water and debris. The scupper must be accessible for debris removal and maintenance. The image below shows an example of a scupper that was incorrectly installed on a flat roof. 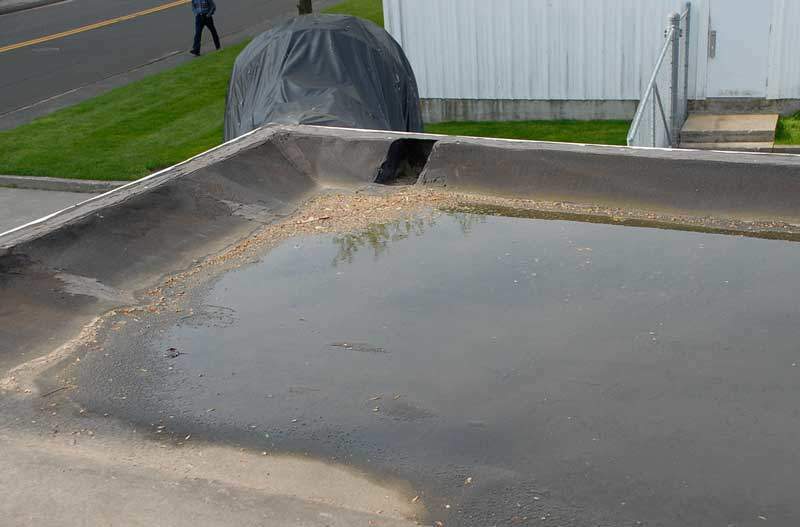 Water could not flow naturally from that position on the roof, which created ponded water that will eventually cause the rubber membrane to fail prematurely. If scuppers are the only way to drain water from a roof, they should always be positioned lower than the roof surface itself. A scupper can be installed on almost any edge of a flat roof when there is an issue of pooling water. Watch the video below. Scuppers are types of drains for both commercial and residential flat roofs. They must be properly installed to accommodate the volume of water and debris that needs to flow off of a roof and away from its foundation.